September 10th 2011 will mark the 60th anniversary of an auspicious event in the history of world cinema. On that date in 1951 Rashomon won the Golden Lion at the Venice Film Festival, introducing western audiences to not only Akira Kurosawa but to the riches of Japanese cinema in general. Rashomon went on to win an Academy Award and its director became an international figure, but he wasn’t the only Japanese filmmaker winning new admirers during this period. In 1952, Kenji Mizoguchi (who was apparently fiercely jealous of the younger director’s acclaim) won the International Award at Venice for The Life of Oharu and he later won back-to-back Silver Lions at the same festival with Ugetsu monogatari and Sanshô dayû. As the western world discovered Japanese cinema, these filmmakers were its twin leading lights. At some point during the subsequent years, that perception changed. Mizoguchi died in 1956 and the stature of his work gradually seemed to fade with his passing. If you ask people to talk about the great Japanese directors today, Kurosawa will probably be their first answer with Yasujirō Ozu being the most likely second response. It seems they are now widely regarded as the two titans of that country’s cinema and as two of the most respected and influential filmmakers of all time, and while I’m not going to argue against that evaluation, I can’t help wondering why Mizoguchi’s own considerable body of work has quietly slipped out of view. I would suggest that his films are every bit as impressive and vital as anything else produced in Japan in this period. In fact, you could make a fair case for him being the greatest of all Japanese filmmakers. Before I do make such a case, I must make a confession: until recently, I too was largely ignorant of Mizoguchi’s films. I had seen and loved his Sanshô dayû, but it was only when I watched The Life of Oharu and Ugetsu monogatari in quick succession that I realised this was a director who demanded further exploration. I was astounded by the emotional resonance of his storytelling and the formal beauty of his elegant mise-en-scène, and I was particularly struck by the director’s complex portrayal of his female characters. The opportunity to investigate Mizoguchi’s oeuvre in more detail came with the release of the “Late Mizoguchi” DVD box set from Eureka’s Masters of Cinema series, which contains eight films from the prolific director’s last five years (he directed over 75 features in total, though some early ones are now lost) and showcases the astonishing depth and relevance of his work. Mizoguchi’s directorial style was deceptively simple. On set, he was a perfectionist, and long before Kubrick or Fincher demanded endless takes from their actors, Mizoguchi was infamous for his rigorous approach to rehearsals and preparation, often insisting that his actors run through their scenes as many as 100 times. (Kinuyo Tanaka, a regular performer in Mizoguchi’s films, once claimed he asked her to read the contents of an entire library before shooting.) All of this was aimed at facilitating a kind of effortlessness on screen. The actors appear to completely inhabit their roles in Mizoguchi films and are encouraged to give natural, subtle performances in the long takes that the director frequently favoured. Mizoguchi’s camera movements are often ambitious and complex, and his films are full of artfully composed tableaux and recurring motifs, but his aesthetic style never draws attention to the technique involved – everything is focused on the story. So if Mizoguchi’s filmmaking is masterful from a technical point of view, then perhaps it’s the stories he chose to tell that have seen him fall out of favour among the masses. Of the films that Mizoguchi made for Daiei in his last decade (the ones that appear in the Masters of Cinema set), roughly half were period films which were often drawn from Japanese folklore. This detail, combined with the fact that Mizoguchi only ever made two colour films (one the little-seen Shin heike monogatari) and his stately, refined style, might make his work seem – to the unitiated – unfashionable or outdated, but nothing could be further from the truth. At the core of all Mizoguchi films you will find the same consistent themes and ideas, many of which (such as the essential cruelty of humans to one another, or the pressure to conform in a strict society) still resonate in a universal manner today, but one theme preoccupied the director more than any other – the plight of woman. I can’t think of any other filmmaker who has returned to the theme of female suffering more consistently or with more determination. For Kenji Mizoguchi, it was personal. 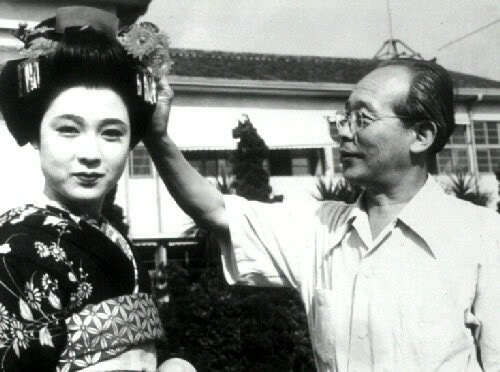 Mizoguchi’s history with women is long and complicated. His sister was sold to a geisha house when they were both teenagers and his mother frequently suffered at the hands of her abusive husband. Some years later, Mizoguchi’s wife went insane and was committed to an asylum, while he had many relationships with prostitutes throughout his life, one of whom slashed his back in a bathhouse during a fiery encounter. Bearing all of that in mind, it should come as no surprise that the female aspect of Mizoguchi’s work is often the most fascinating. A number of his films depict men as selfish, cruel or weak-willed and show us how their decisions adversely affect the female characters. 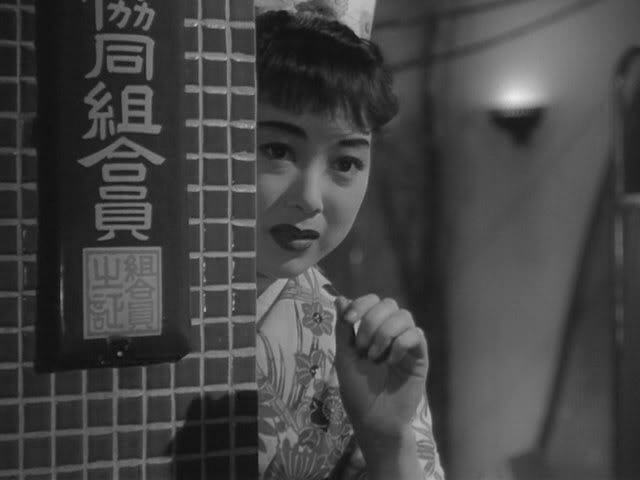 The director frequently highlights the hypocrisy of society’s treatment of women, with one female character asking why it’s OK for men to commit adultery but not women in Chikamatsu monogatari, and the prostitutes of Akasen chitai (often referred to by its more lurid and inappropriately pejorative English title Street of Shame) similarly lamenting the injustice of their chosen profession. There’s no doubt where Mizoguchi’s sympathies lie in all of these films. His female characters are exploited and downtrodden, but he imbues them with an inner strength and an unshakable dignity. In his magnificent film Gion bayashi a young geisha defends herself against the drunken businessman aggressively molesting her by biting his lip; Mizoguchi’s heroines may often end up being defeated by circumstance, but they won’t go down without a fight. Kenji Mizoguchi died of leukaemia in August 1956, leaving behind a body of work that ranks alongside that of any other filmmaker. At the time of his death he was developing a comedy called Osaka Story (eventually brought to the screen by Kozaburo Yoshimura), and it would have been fascinating to see him bring his customary deft touch, formal skill and deep humanity to a more lighthearted venture. Instead, his untimely passing ensured that Akasen chitai would stand as the last film Mizoguchi ever made, although it doesn’t feel like the work of an ailing master. The movie, an unsentimental portrait of life in Tokyo’s (soon to be outlawed) red light district, has the rough energy of a much younger filmmaker, as Mizoguchi experiments with a more urgent style and a daringly innovative soundtrack. It shows that he was always searching for new ways to explore classic themes, and the film’s devastating final image acts as a fitting epitaph for this great feminist director, presenting us with an anxious young woman as she takes her first tentative steps down a road that has destroyed so many women before her. I’m ashamed to say I don’t think I’ve seen *any* Mizoguchi. This piece has made me feel that is something I really need to rectify. Thanks for it. Me too. I’ve always meant to get around to seeing a few of his films. Hopefully this great introduction will make me try harder. Akasen chitai translates as “Red-light District” (or “Red-line”, over-literally) — less judgemental, certainly, but I’m not sure if it’s actually less lurid. Maybe next we need an article titled “Mikio Naruse – Japan’s Forgottener Master”. I think the depiction of women in his films, and his relationship with women in life, is fascinating and is a real warning against reading a simplistic correlation between a director’s attitude and the ‘attitude’ of the films. It seems that Mizoguchi was able to display an empathy and respect for women in his films that he found harder to find in real life (he could be hard on female collaborators as well, I half remember a story about how he tried to put a spanner in the works of Kinuyo Tanaka’s career as director). It’s ghard not to wonder if the difference was about guilt or the films offering an space for insights he gained from being less than perfect, and the places that took him too, but that’s probably too simplistic. I’m in the same boat (no narrative pun intended) and have only just been introduced to Mizoguchi last night at the BFI with Sancho the Bailiff. A very moving film. Before that I too would have named Ozu. Great piece.